We've been working with our user experience team to help our users discover relevant and timely developer product information faster on the Google Code homepage. Where it previously required several clicks to find the latest product news and announcements on the Google Maps API blog, for example, the newly redesigned homepage now surfaces this information at a glance. The new homepage will be updated regularly with our latest product news, coding tips, developer profiles, videos, and cool examples. See the screenshot below for an example or visit Google Code now for the latest updates. Be sure to subscribe to our new aggregate Google Code: News Feed in your favorite feed reader to receive all the Google developer updates as they happen. And please tell us what you think about the new homepage. 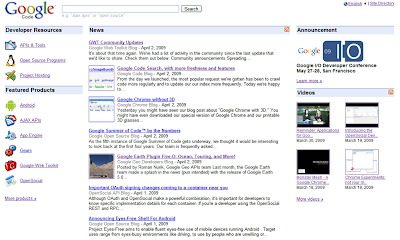 Kind of funny that your screenshot links to a larger screenshot instead of the Google Code homepage.